The location was near Dulles Airport in Virginia. The "Take it!" was the smaller size of the trees and their uniformity. The intensity of the color being displayed by each was part of the delight in the viewing of them. This was one I had been watching for some days as the splendor of fall was taking place. Choosing just the right moment to take a leaf color based shot is a real game of chance. So many things can happen, such as waiting just a little too long, and have wind or rain come along and take the majority of the leaves down, or worse, completely off. So I played a waiting game, with a mix of watching the color deepen and completely take the trees over, and the apprehension that came from the formerly stated reasons. My clue that it was time was seeing a few fallen leaves showing themselves on the vividly green grass growing under the stand of trees. Not to be without notice, was the blue of the sky, a true case of " it could not get any better," or " Ideal conditions." The After Take: The joys of this one are several. Quite honestly, the biggest is in watching the reactions of the first time viewer of this photo to the title given to it. It is almost always a smile, especially from female viewers. There is just something about a red dress. The layers of color coming from the bottom of the picture was a quite unexpected addition. The gray of the asphalt drive, the yellow of the warning paint on the bordering curb, the smooth green of the cut grass at the feet of the trees, all set a wonderful floor to the picture. The youth of the trees featured was emphasized with the larger trees in the borders and background. My girlfriend and I got a kick out of this picture. 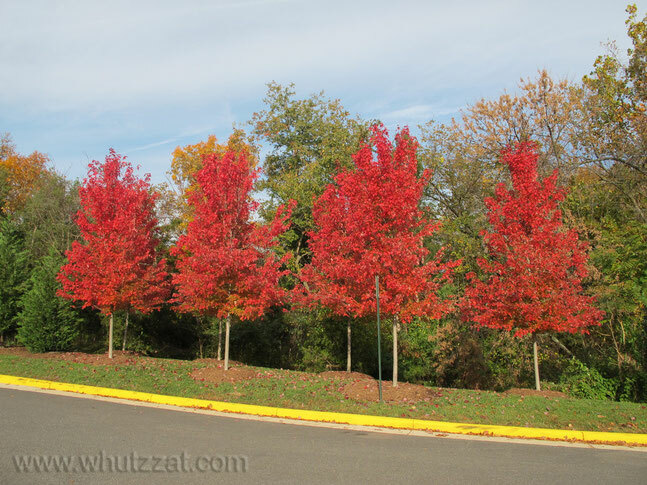 The trees are so red, wish we had that here in Florida. We NEVER get trees like this out here. Look again man. Look hard and you will see!